Bird strikes are a significant threat to flight safety and have caused several accidents with human casualties. Although the aviation authorities keep birds away from runways, serious accidents still take place and aircraft manufacturers are required to conduct bird strike tests. The key is to pass these tests first time as failure to do so results in costly re-design, lost time and effort. Aircraft manufacturers now make use of virtual crash testing and the simulation of bird strike impacts on critical safety components such as wing leading edges and other vulnerable structures such as cockpits and exposed fuel pump fairings. 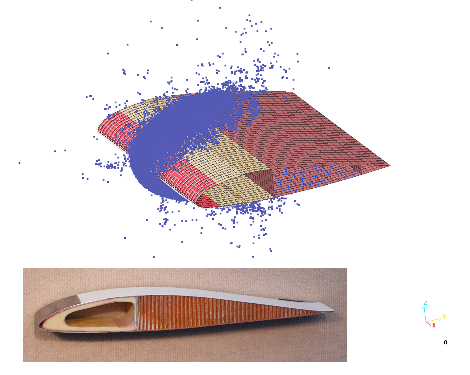 Simpact have experience in the area of bird strike simulation and airframe structural development. Typically these aircraft structures are made from metal and/or composite materials and we make use of the non-linear explicit FEA codes RADIOSS or LS-DYNA3D and their SPH (Smooth Particle Hydrodynamics) element formulations for representing the bird models. SPH offers an effective and computationally efficient method for simulating the bird and the large deformations and fluid like effects.